Today we want to share with you a wonderful song some students designed. Taking advantage of the vocabulary we were learning in class, some students in 4th grade were asked to start writing the lyrics of a song we could all use to better remember the words we have been studying. Here, we share with you the fantastic result and, at the same time, we encourage you to sing the song with your children at home! Don’t forget that music is an amazing and powerful tool that can help us a lot in the process of learning a new language! Avui volem compartir amb vosaltres la meravellosa cançó que alguns alumnes han estat dissenyant. Aprofitant el vocabulari que s’estava treballant, alguns nens i nenes de 4t van tenir l’oportunitat de començar a crear una nova lletra musical per tal que tots aconseguíssim recordar millor totes les noves paraules que havíem estat estudiant. Aquí, us deixem el fantàstic resultat i, alhora, us encoratjem a cantar la cançó amb els vostres fills a casa! No oblideu qeu la música és una eina increíble i ben poderosa que pot afavorir el procés d’aprenentatge d’una nova llengua! 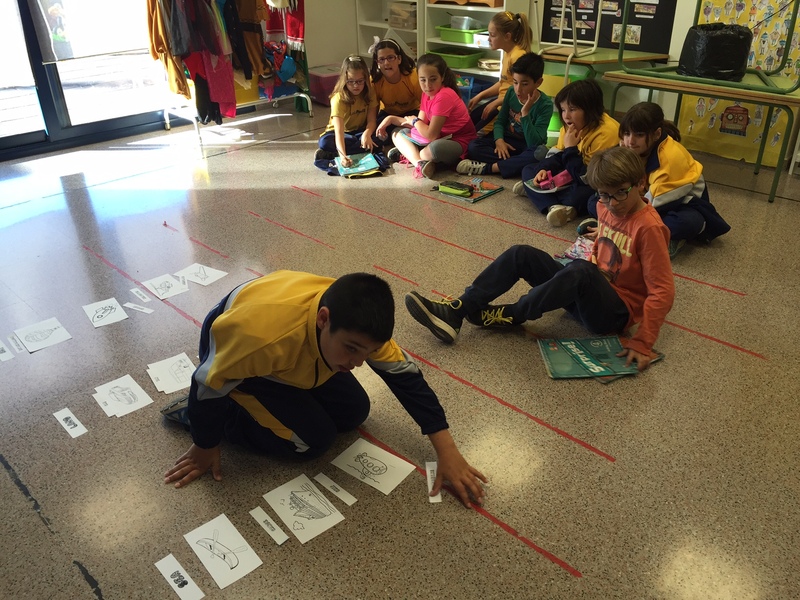 Els alumnes de Cicle Inicial hem pogut aprendre més coses d’anglès gràcies a la projecció d’algun dels capítols de la mítica sèrie de la BBC Big Muzzy. Si voleu podeu aprofitar aquest divertit recurs per gaudir d’una estoneta amb els vostres fills amb una sèrie molt educativa i fàcil de seguir per tots els alumnes. Enjoy it! Throughout our English course we’ve always tried to do things differently. Bearing in mind the importance of putting things into a real context as a means to internalize and acquire language efficiently, we thought that maybe our students could use their ingenuity and think up theatrical situations to put grammatical structures into use. Therefore, our students were told to create situations in which it had to be crystal clear the difference between WILL and GOING TO auxiliaries. Since students sometimes experience certain doubts on when to use which, by making it visual and real maybe the doubts could be reduced. So here you have some samples of grammar practice fuelled by the imagination, sense of humour as well as theatrical talent of our students!! Check out how both grammatical structures are alluded implicitly.